This gentle spray cleanser for no-rinse application on hair, face and entire body enables uniform application over larger areas of the skin. Spray on washcloth or directly on skin to handle messy cleanups or unpleasant odors. Contains conditioners to help minimize friction and can be used on intact, irritated or denuded skin. 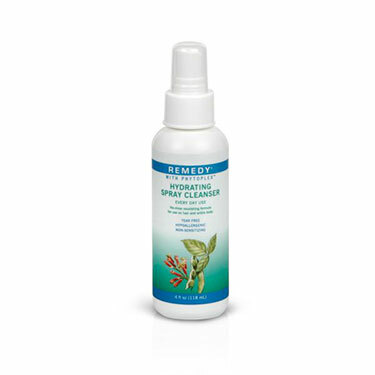 Enhanced with Phytoplex and other botanicals, this cleanser is ideal for everyone from neonates to geriatrics. Available in individual 4 oz bottle, case of 24 4 oz bottles, or a case of 12 8 oz bottles. Smell is pleasant but not fond of the sprayer. It is uncomfortable to handle and clogs if held upside down on a standing patient. I love this stuff. It enables you to clean what wiping won't get, and any other area of the skin. It is very gentle and even has a gentle. smell.